Larry Tournor of Aurora is the second winner of a 2019 Ford F-150 XLT 4x4 SuperCrew Flex Fuel truck in the 24th edition of the Nebraska Lottery’s $2 Truck$ & Buck$ Scratch game. 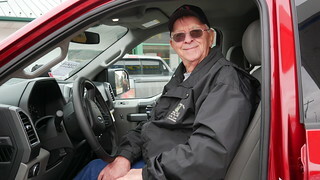 Tournor purchased his winning Truck$ & Buck$ ticket at Pump & Pantry, 1304 Q Street in Aurora. The ticket contained three KEY symbols in Game 2 to win the corresponding truck prize. The 24th edition of the Nebraska Lottery’s popular $2 Truck$ & Buck$ Scratch game features the 2019 Ford F-150 XLT 4x4 SuperCrew Flex Fuel truck as its top prize. Players have the opportunity to win one of seven Ford F-150 trucks as well as cash and Ethanol-enriched fuel prizes. The truck prize is valued at $54,600, which includes $1,214 for costs associated with ownership and state and federal withholding paid by the Nebraska Lottery of $2,730 and $13,104, respectively. The odds of winning the top prize in Truck$ & Buck$ are 1 in 300,000, while the overall odds of winning any prize are 1 in 3.09.